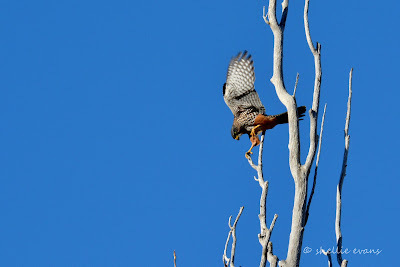 I mentioned in the last post that we saw a second New Zealand Falcon on our road trip over Danseys Pass, the first was chasing a smaller bird down a narrow gully, they disappeared over a rise at great speed and we didn’t see the outcome of that battle. 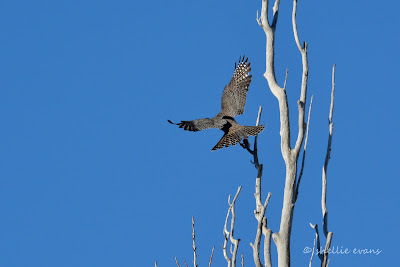 The second happened when we stopped at Kyeburn Diggings to watch three Australian Harrier Hawks/Kahu swooping and diving through thousands of finches which were feeding on the seeded grasses that were growing in a paddock of winter stock feed. 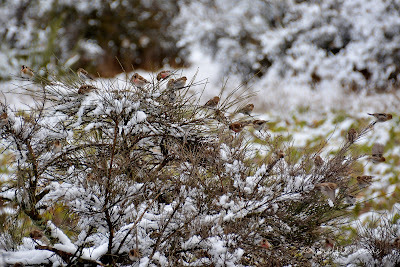 These are mostly Redpoll Finches with a few Goldfinches scattered in amongst them with slightly larger (and possibly slower flying) Chaffinches around the periphery of the flocks. 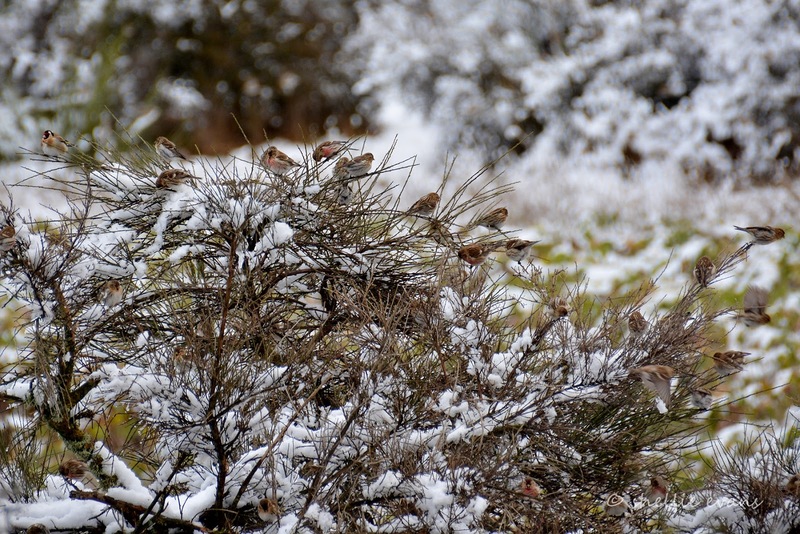 Redpolls are the smallest of New Zealand’s introduced finches and are widespread throughout the South Island but not so abundant up north. 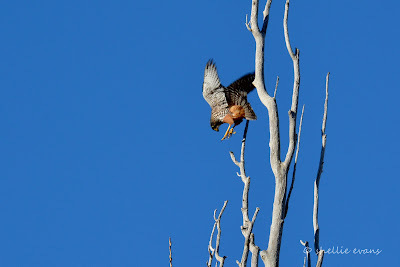 There were thousands of birds lifting and swooping, swirling and landing for a moment before lifting again. 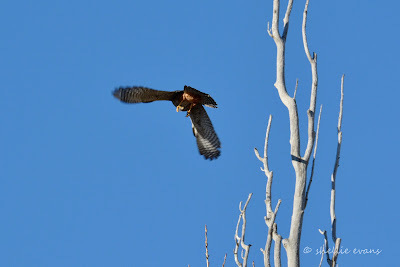 The chatter and wing noise was amazing and no matter how often I tried to catch them up close they spooked, with the hawks hunting through the masses, they were on full alert. I managed to catch a few birds as they stopped briefly on some bushes nearby- a lone male goldfinch at the top left and the rest are redpolls. 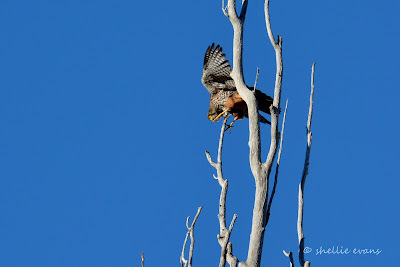 When mature, both sexes have the red patch on their heads (poll) with just the males having the colour on their lower throat and chest after their second year moult. Juveniles have no colouration. 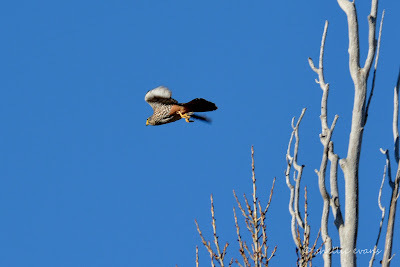 Without these photos it was extremely hard to identify the birds, they were so fast and quite a distance away. We couldn’t keep up with them even with the binoculars. While we were watching the hawks swooping over and scattering the flock a slightly smaller, faster bird came flying through, swooped up and landed awkwardly at the top of a tall poplar tree just behind us. At first we thought it was one of the hawks and as we trained the camera & binoculars on it, it still took us a few seconds to realise with stunned disbelief and great delight that is was a NZ Falcon/Karearea. 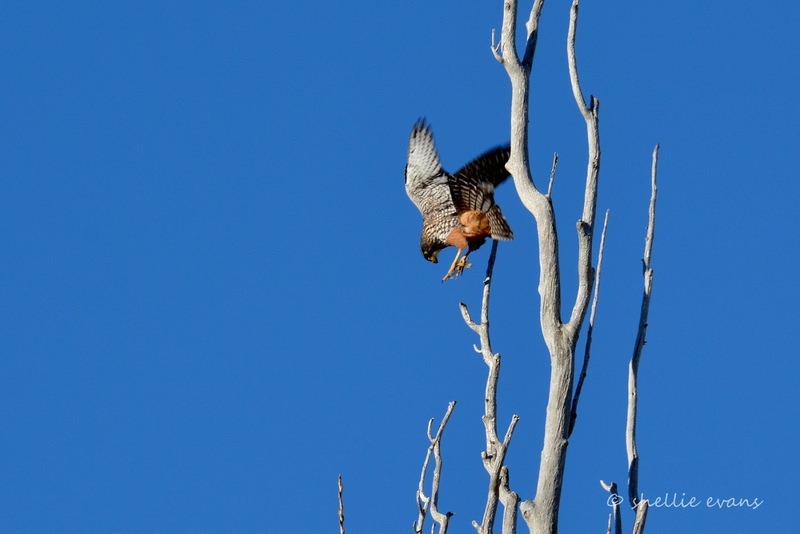 Falcons are one of only two New Zealand endemic birds of prey- the other being the native owl, the Morepork/Ruru. 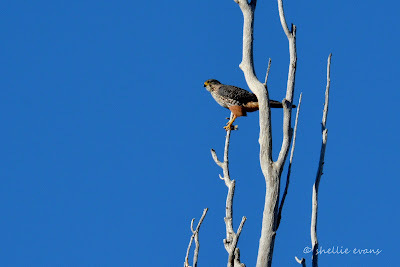 Falcons are found throughout New Zealand but are quite rare. 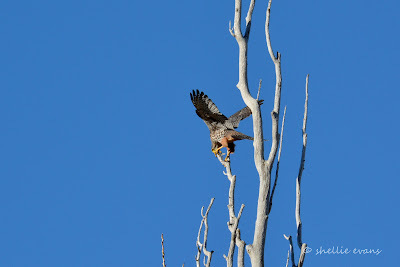 The NZ Falcon is one of the fastest falcons in the world capable of flying at up to 200 km/h, they hunt live prey mainly by watching from a vantage point and making a fast direct flying attack striking or grasping the prey with their sharp talons and killing with a powerful bite to the neck. 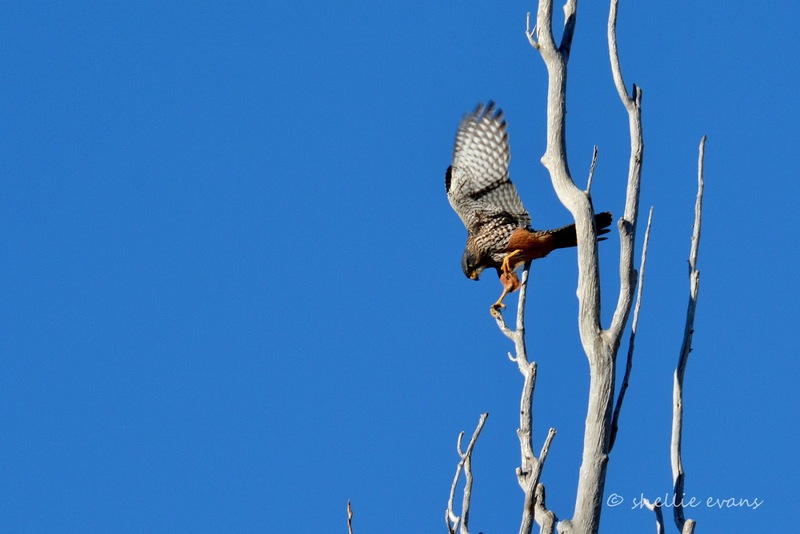 They’re capable of catching prey larger than themselves but their diet mainly consists of small birds. 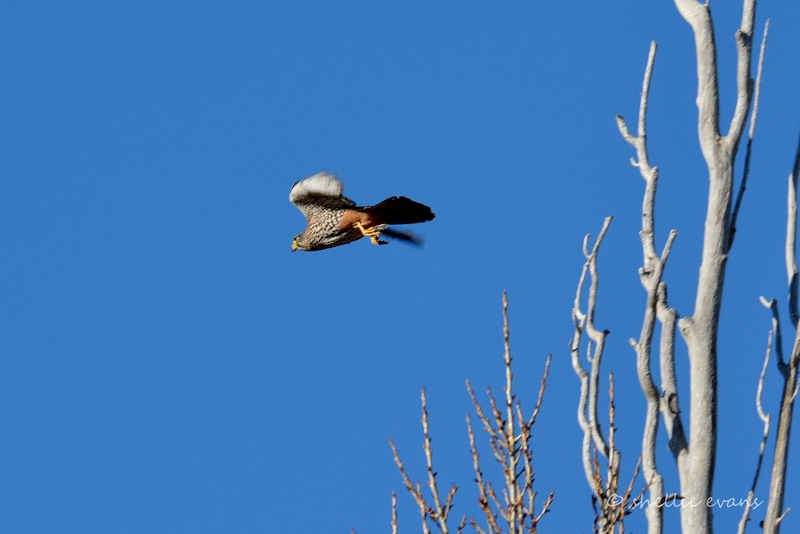 To land in the top of the poplar next door…. ….where it still had trouble holding on…. 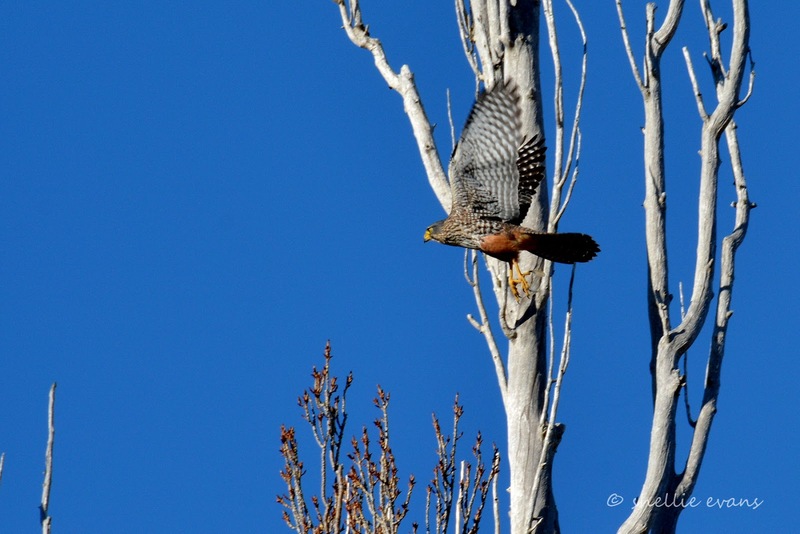 …bounced up in the air…. 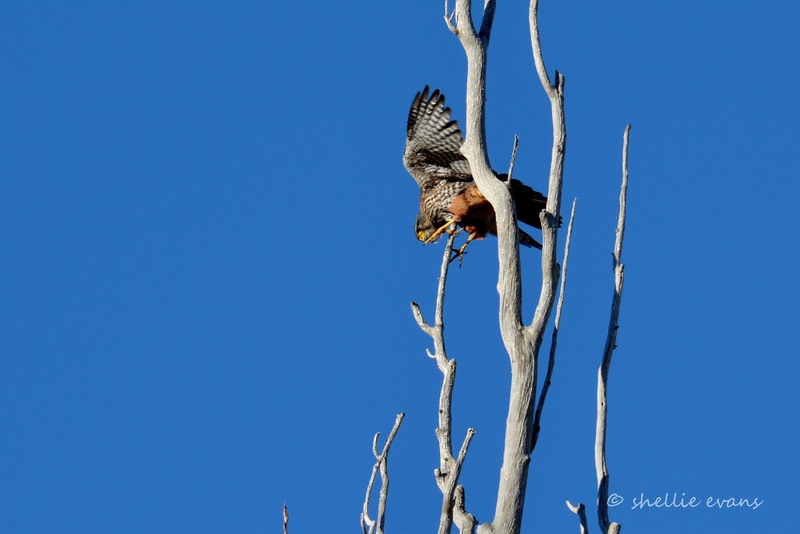 …so lifted off heading to the right…. 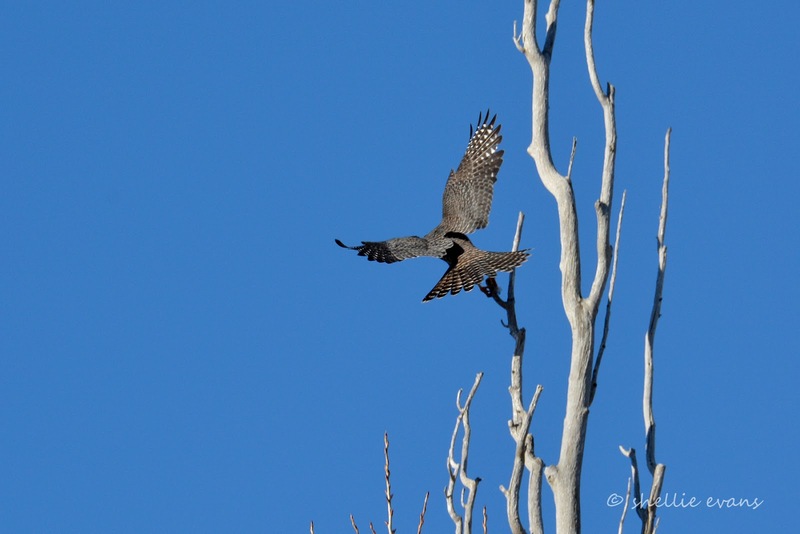 …before changing direction and sweeping around and dropping into a spectacular stooping dive back over the paddock scattering thousands of finches along the way. 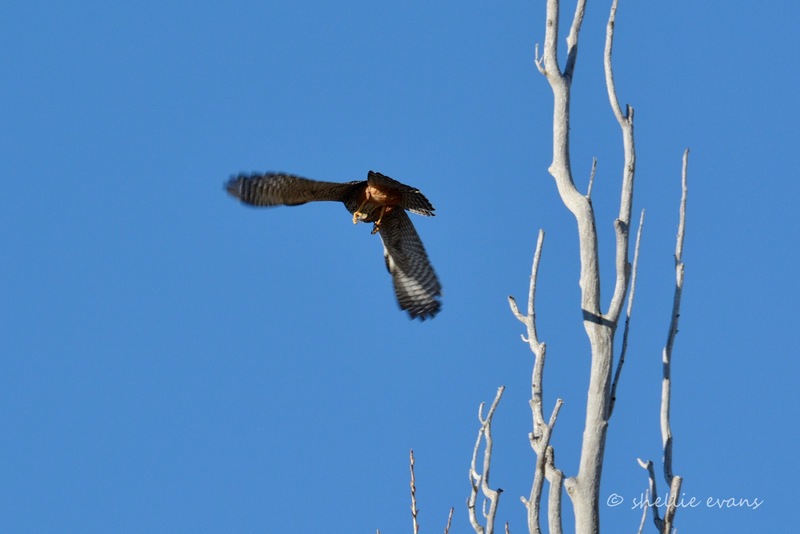 She disappeared along the river at the end of the paddock and we didn’t see her again, even though we returned a few days later where we found the hawks still working the field. 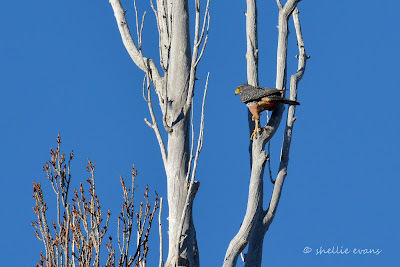 It was another thrilling encounter with a rare and endangered bird and extra special that we were able to watch it for a good minute or so before it moved on. 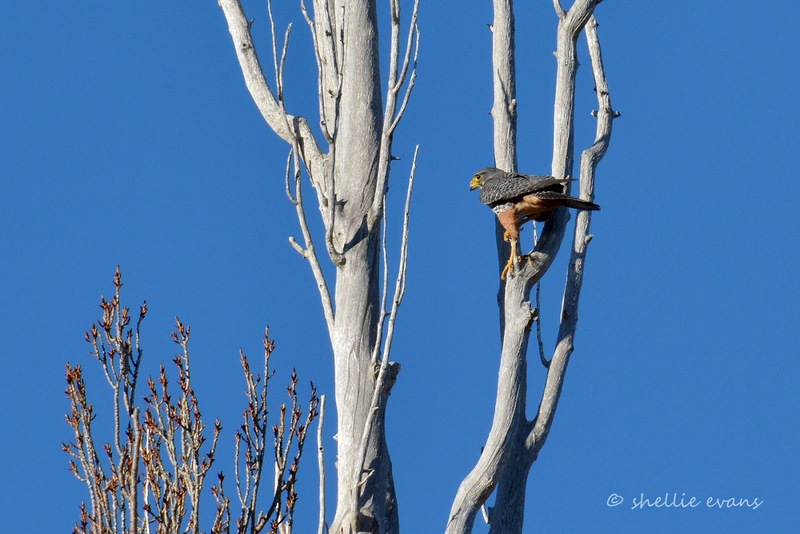 Most of our sightings recently have been very brief and usually on the wing except for our first encounter on the Catlins River back at the beginning of our travels. 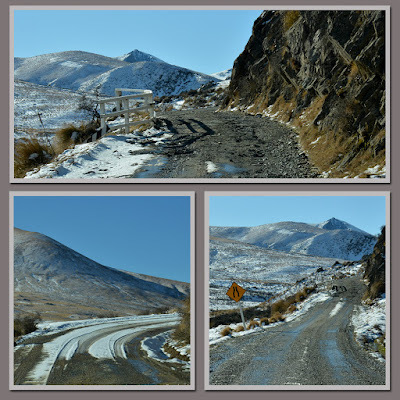 As soon as the weather cleared after our wet trip from St Bathans to Ranfurly, we set off to explore Danseys Pass before the forecast snow closed the road. 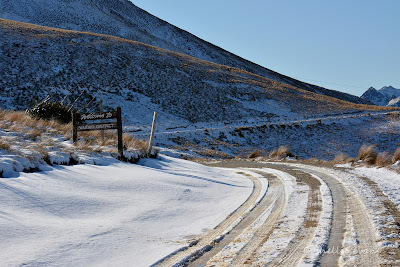 Danseys Pass is a mountain pass located in the Kakanui Mountains, and even though it’s a narrow gravel road, it’s a fairly well used link between Ranfurly & Naseby in Central Otago and Duntroon in the Waitaki Basin in inland Canterbury. 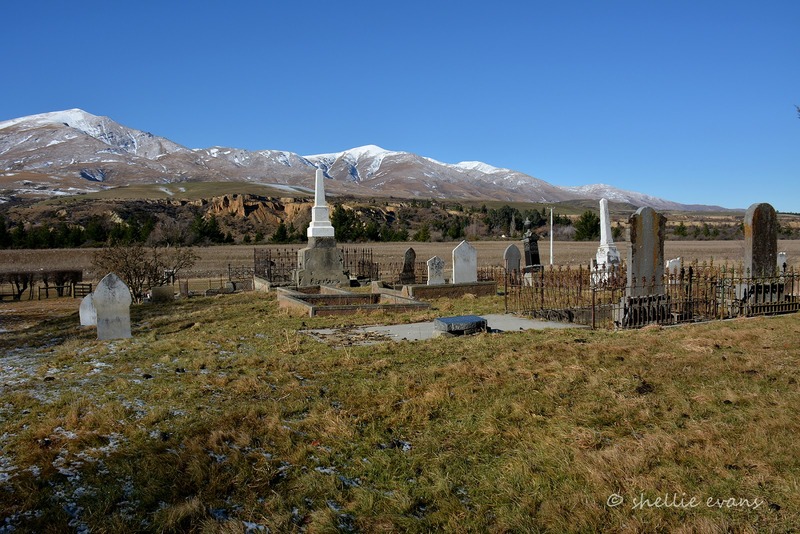 We drive through Naseby (more on this village in another post) and head towards the mountains along the Kyeburn River flats. 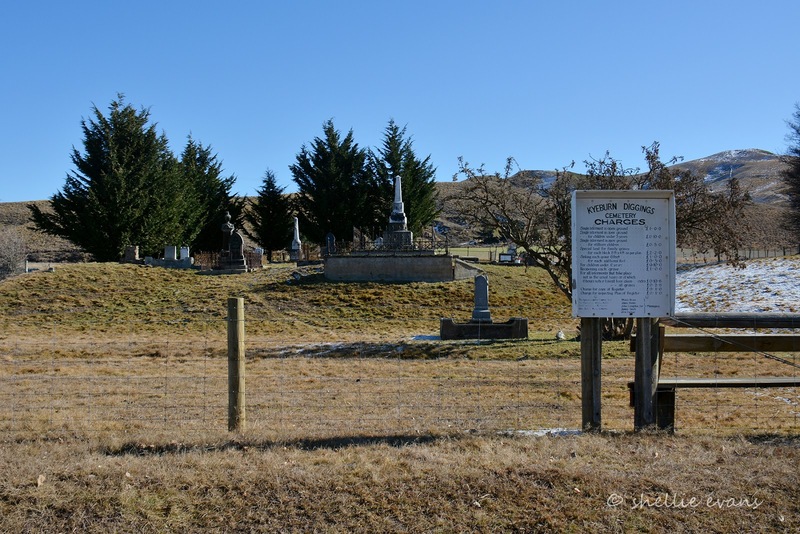 The gold fields in the Kyeburn area, known as the Kyeburn Diggings were well underway before the main discovery of gold at Naseby 30kms away. Coal mining was also important at Kyeburn, and good quality lignite was worked until about 1900. There was once a bustling town of over 2000 people with hotels, stores, butcher, baker and a school. 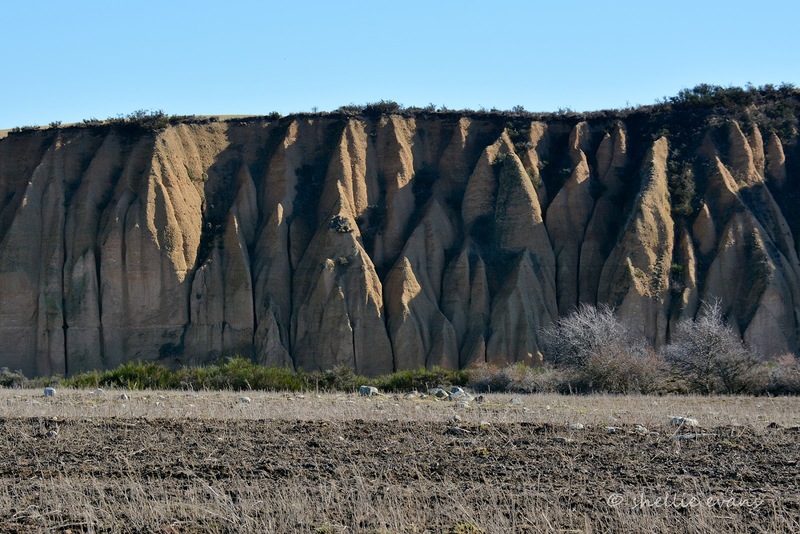 All that is left now are the piled high tailings & scars of sluicing and dredging along the cliffs of the Kyeburn…. 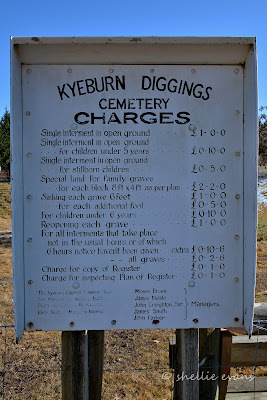 ….and the old Kyeburn Cemetery with it’s historic tariff board showing service charges for burial in the gold mining era of the late nineteenth century. In those days £1 represented a lot of money. The cemetery is still in use today and in fact we met an old timer later in the week who told us this would be his final resting place when his time came. It is always thought provoking visiting old cemeteries and we're often moved by some of the sad stories that lie behind the gravestones. People died very young in those days, and sometimes whole families died within relatively short spaces of time when compared with today’s life expectations. 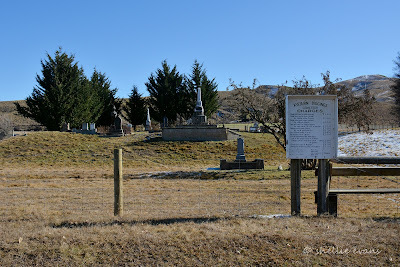 Overlooking Mt Nobbler is a large memorial to four people, including two brothers, who lost their lives on the mountain in July, 1891. Sometimes there are just a few words on the headstone to indicate the story behind the deaths but here, there was an information panel with the complete story- you might not think so but I have condensed it for the blog. The two Meikle brothers, aged 19 & 12, set off with their hunting dogs for a day’s rabbiting on the other side of the mountain range. On their return, laden with rabbit skins, they became separated when the younger brother, Thomas, went back to retrieve a skinning knife. James continued on thinking his brother would catch up. He waited at the summit a short time before thick cloud started to roll in. He continued on to a musterer’s hut, thinking his brother might have returned via another route. 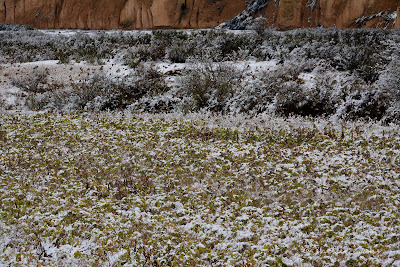 Finding his brother not there he gathered a blanket & food and went back to look for him crossing the summit in thick driving snow. 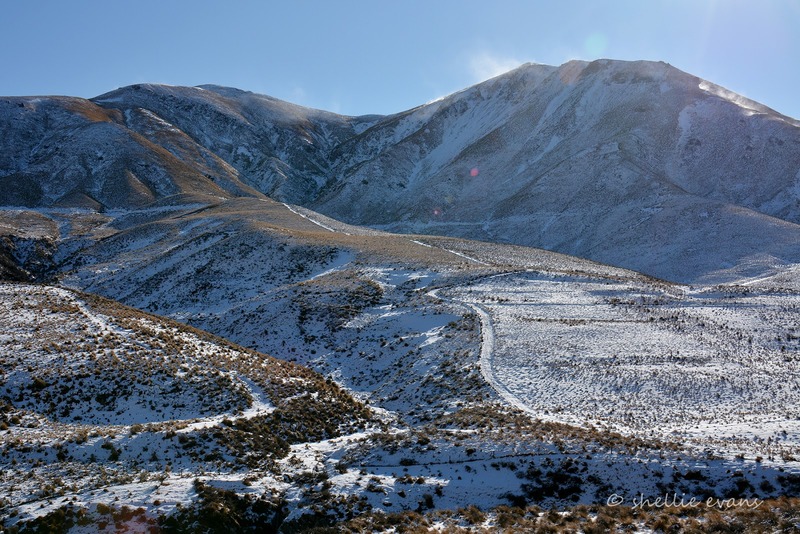 He located his brother after following the smell of a tussock fire which his younger brother had lit to keep warm. Thomas was too weak to travel through the deep snow so they spent the night huddled together under the blanket beside the fire. The next morning the cold was intense and the snow deep, and the younger brother still too weak to travel, so James left him in the shelter of a rock with the blanket & some of their dogs to lie with for warmth while he set off back over the mountain for help. 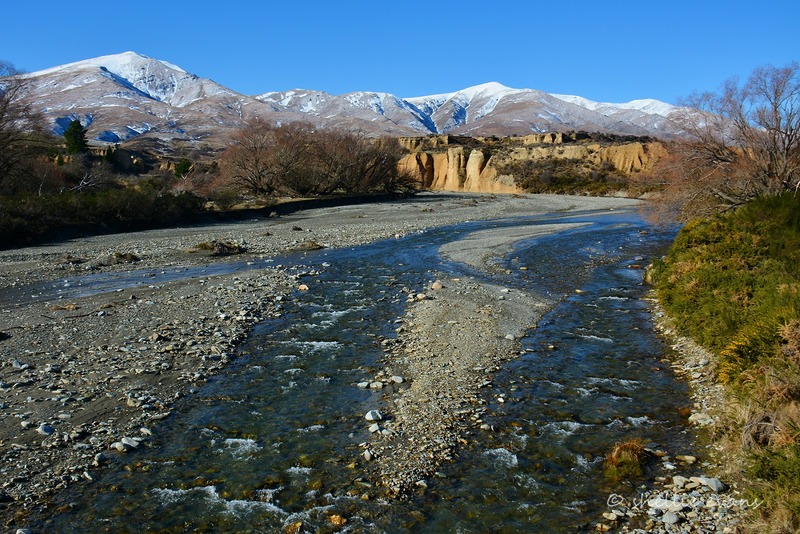 By mid afternoon James had arrived home to get his father and a neighbour and they headed back up the mountain, James’ third ascent in 30 hours. Half way over they were forced to take shelter from another snowstorm. James was now suffering from frostbite to his hands & feet and his father, seeing the situation as hopeless decided they needed to return home. Early the next morning James (frostbite treated) & eight other local settlers & miners went back up the mountain knowing they would be lucky to find Thomas alive after the previous night’s storm. 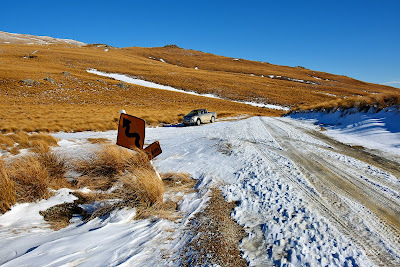 As he led them towards the summit of Mt Nobbler, James realised they should have been on the opposite spur. 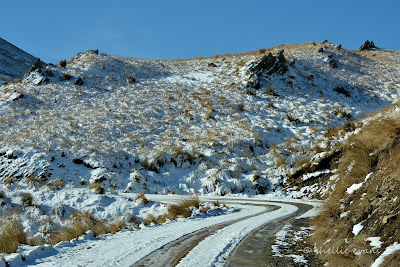 To get there they took a route across a steep snow covered sidling. 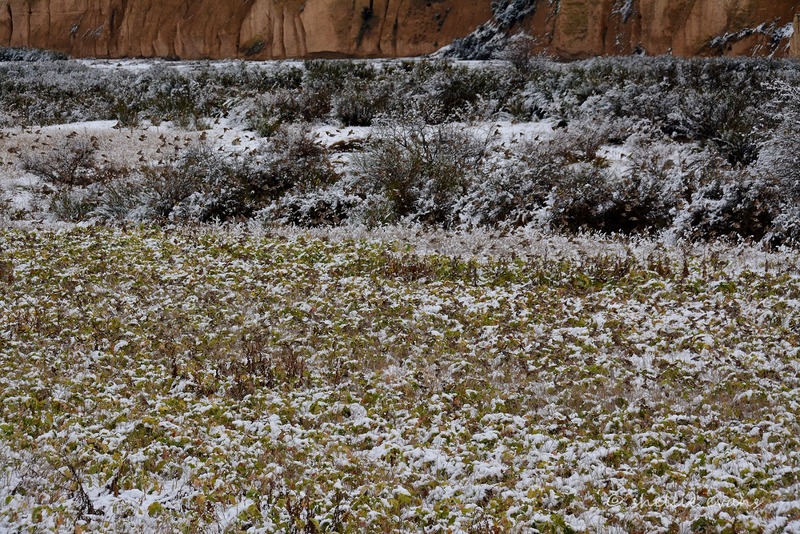 In single file the men started to cross the face when without warning a huge mass of snow swept down the mountain. The first three men, James, Alphonso Beer (age 28) & Robert Blanchard (aged 23) were swept away and buried under tons of rock & snow. A fourth man only escaped by being pulled back by his hair. 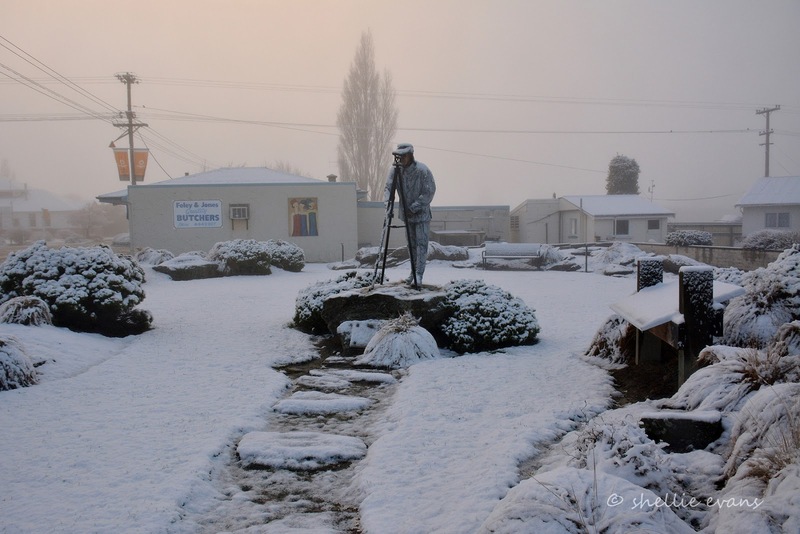 Seeing that there was no hope of anyone being alive, the survivors returned to the neighbours home where one of them rode to Naseby to raise the alarm. Next morning more than 100 miners & settlers went to find and dig out the bodies. A day later a smaller party went over Mt Nobbler by a different route in search of Thomas. The barking of the dogs guided them to where he lay with his cap pulled over his face and his faithful dogs still guarding over him. 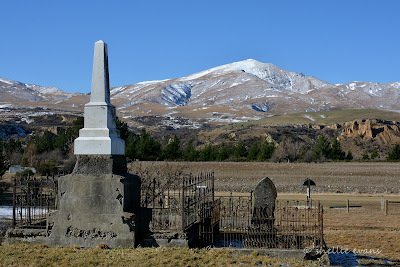 So ends the 1891 tragedy of Mt Nobbler and the first recorded avalanche fatalities in New Zealand. 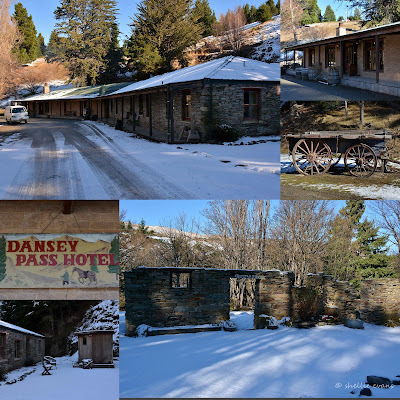 After that rather sobering visit we carried on up the road to one other place left behind after the gold rush, the historic Dansey Pass Hotel. The hotel was built in 1863 and for a time was the centre of activities in the district. Apparently a stonemason called Happy Bill built the stone building in schist and took his payment in beer, a pint for every schist boulder shaped and laid on the thick walls! Remnants of some of the other stone buildings from the settlement are across the road from the inn. The hotel still offers accommodation and a stopover for travellers crossing the Pass although I think it’s probably more of a weekend lunch destination. 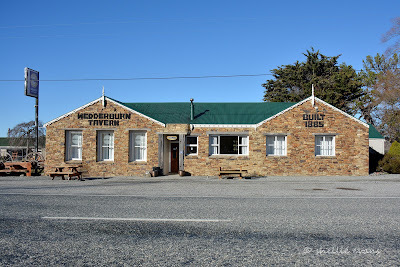 I suspect that there aren’t too many visitors here during the winter and even though there was a fire roaring away inside there wasn’t a soul in sight, not even behind the bar. Just past the hotel we get into the Pass proper where the signs warn of what is ahead and what not to drive or tow to get there. 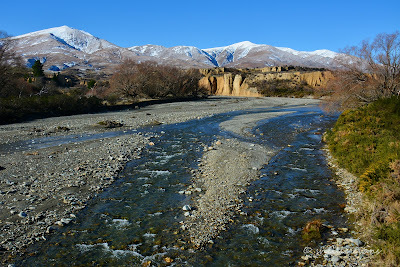 …and the Oteake Conservation Park, a huge & remote area where you can tramp, camp, mountainbike, 4WD and even horse ride. When it’s not winter. The park includes part of the Hawkdun & Mt Ida Ranges and stretches back towards St Bathans and over to Kurow in the Waitaki Valley. What an amazing place it would be to explore, you can download the DOC map here if you’re keen. The road got a little narrow and rough in a couple of places and we hit a few icy patches as we climbed gently higher. 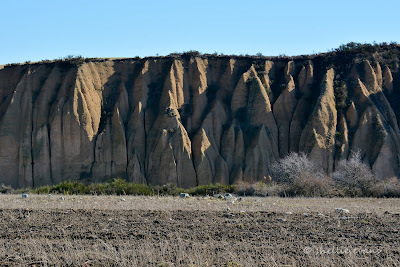 In a couple of places the rough schist walls rose vertically from the road and even appeared to overhang it a few areas, obviously the reason larger vehicles would have trouble negotiating their way past. 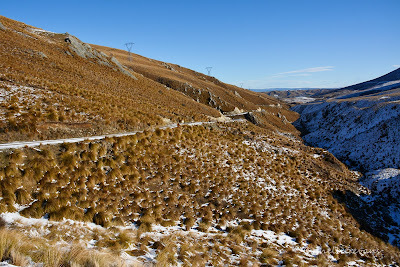 The view back down the valley over the snow tussock was stunning and we were thrilled to spot a NZ Falcon/Karearea chasing it’s lunch, a smaller bird, past us at very high speeds as they both weaved, ducked and dived their way down the gully on the right. 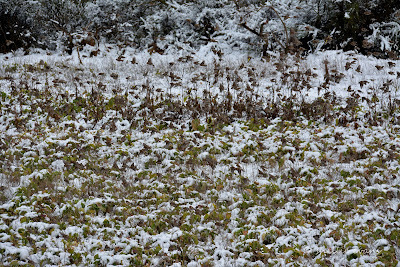 It wasn’t going to be our last sighting of a falcon that day either. 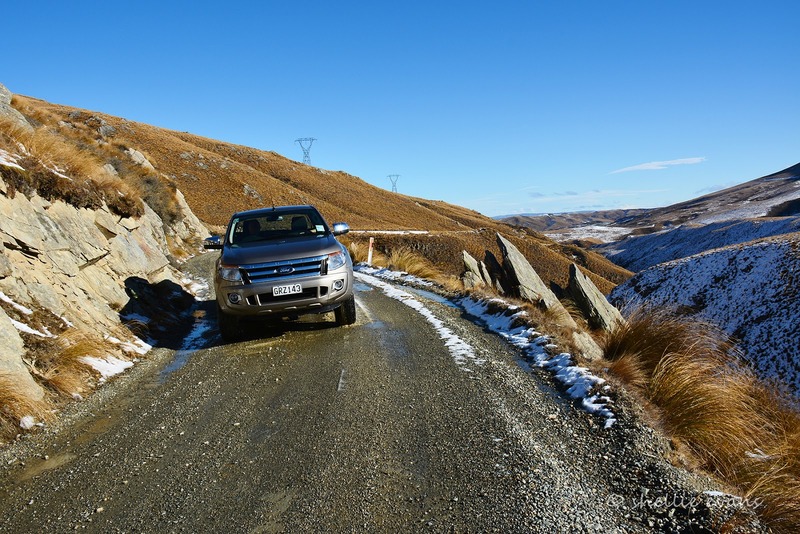 There were some interesting schist rock formations along the road, this one looked as if it had just been pushed off the side. At another stop there are some old bridge abutments. 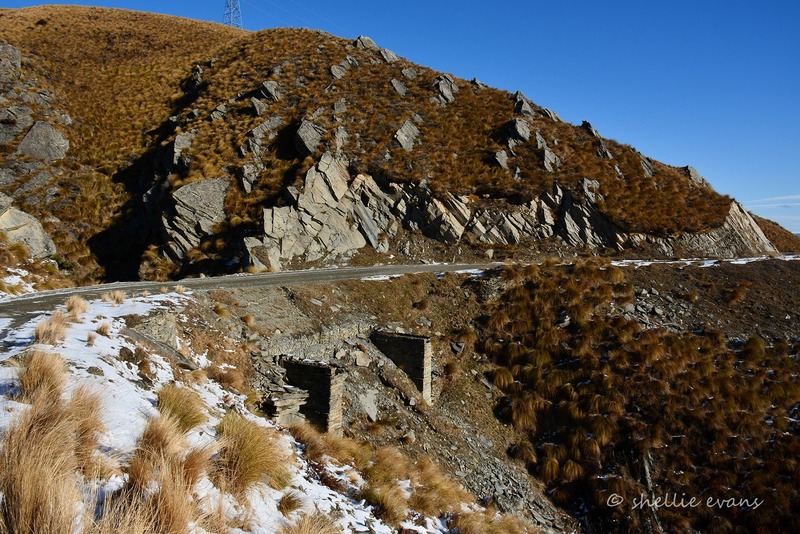 More than likely they’re left over from the original track through the pass used by teamsters and their wagon trains plying their trade between the Waitaki Basin and the gold fields of Central Otago. Heading towards Mt David (good name) and luckily the snow on the road is more slush than ice…. 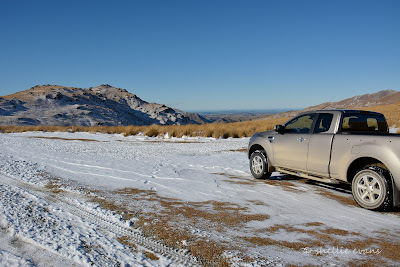 …we arrive at the summit- Danseys Pass, 935m. We decide this will be as far as we’ll go, it’s mid afternoon and freezing cold outside with a stiff wind blowing. We don’t want to be caught on the wrong side of the Pass when everything starts to freeze up as the sun drops. 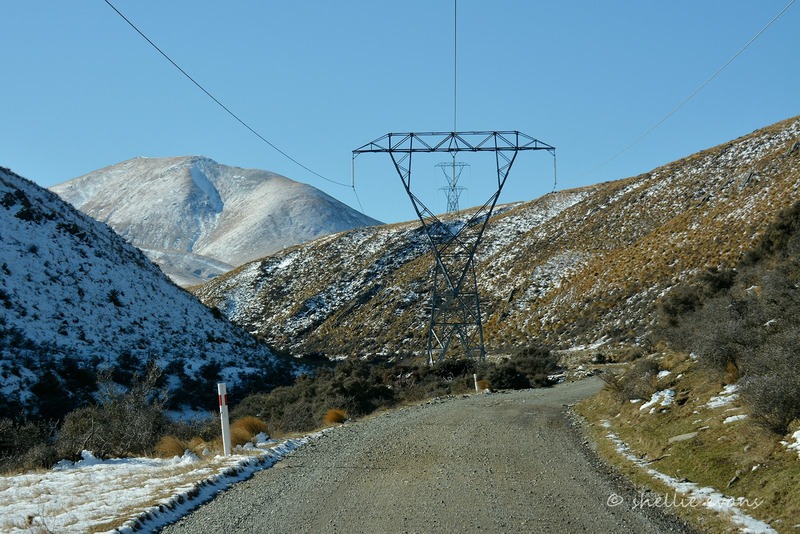 We didn’t quite join the link, we probably only had about 12kms to travel down the Waitaki side to meet a point where we had travelled to last year when we were checking out Duntroon & Earthquakes (yes a settlement with that name). 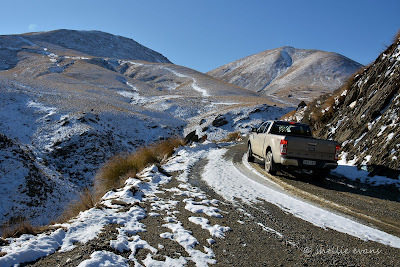 Perhaps we’ll travel up the Waitaki side of the Pass another time when we’re in that area. A panorama from Danseys Pass, looking out over the Waitaki Basin towards the Pacific Ocean with the east coast, between Timaru to the North & Oamaru to the south, in the distance. 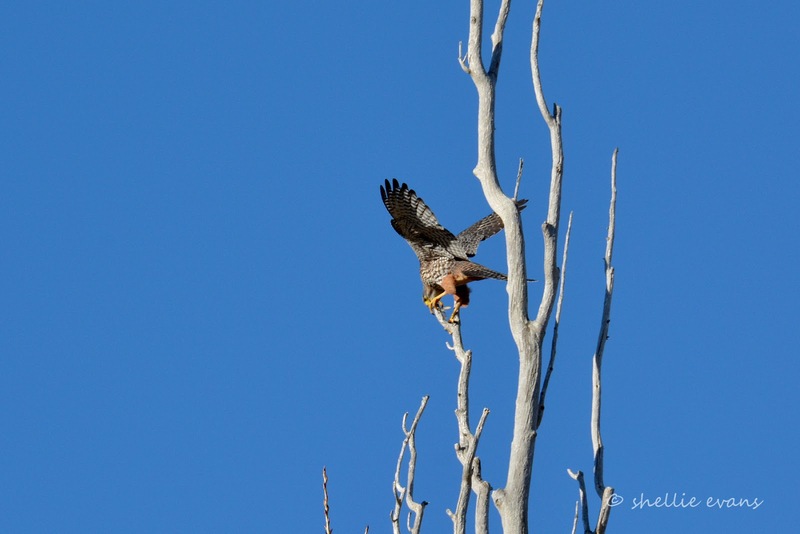 …with one final stop near the river at Kyeburn Diggings to watch thousands of finches feeding in a paddock of stock feed swedes and where we were to see our second falcon of the day. But you’ll have to wait for the next post to see that. 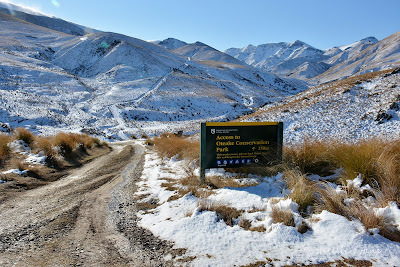 We left St Bathans Domain on a very bleak and overcast morning with rain threatening. David was less keen to leave, he’d cleaned the vehicles and if it did rain while we were on the road all his hard work would be undone. We took the long route back to the main road to avoid the muddy gravel road just past St Bathans settlement. It didn’t help our case, the rain started before we reached the turnoff and we drove through to Ranfurly in a steady downpour. 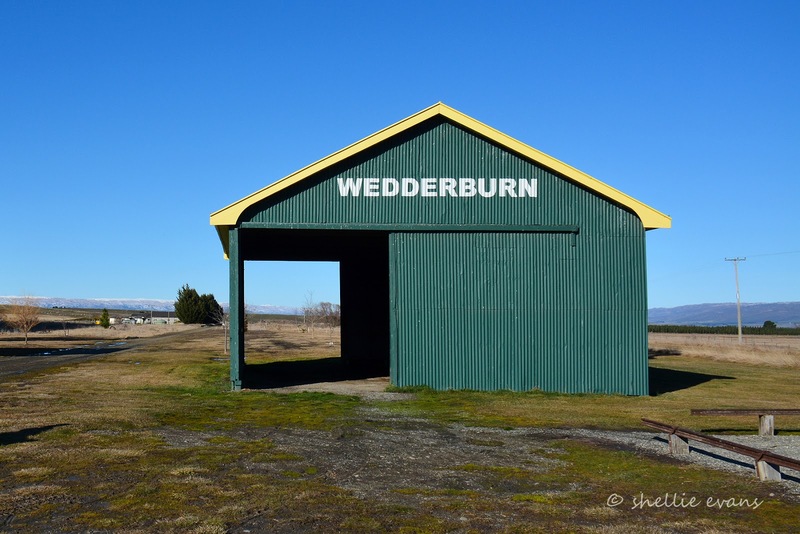 Needless to say I didn’t take these photos of the iconic Webberburn Goods Shed on our way past, we drove back there on a fine day. Once again the 1975 Graham Sydney painting “July on the Maniototo”, made this goods shed famous. 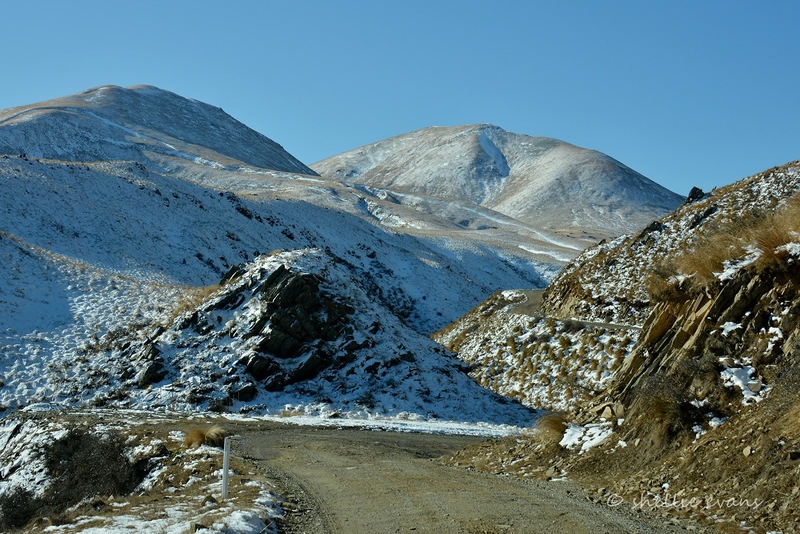 After the closure of the Otago Central Railway line, the goods shed was moved 5km away to an open cast coal mine at the head of the Ida Valley. It eventually became home to feral pigeons. 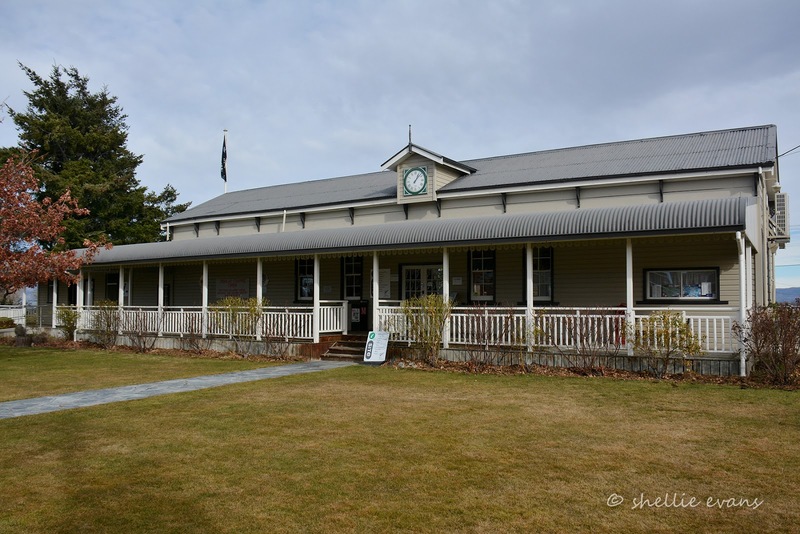 When the Rail Trail began the community was keen to see the old building put back in its original place. In 2002 it was returned on the back of a truck and restored to its original green colour (it had been painted red). It is now an icon of the Trail and the Maniototo – and it is still home to the pigeons. 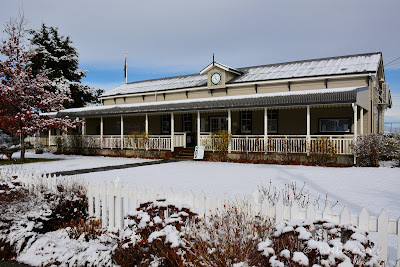 The original small Wedderburn Station, built in 1900, was also recovered and restored to its original home (a curling club had moved it 300m to the west). 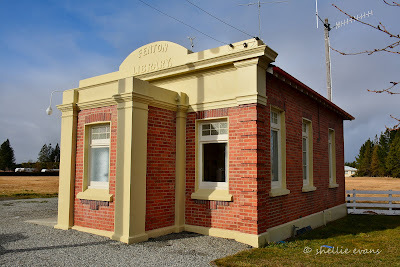 This is the last remaining Vogel Class 5 Station and ticket office in New Zealand, with a simple lean-to design. 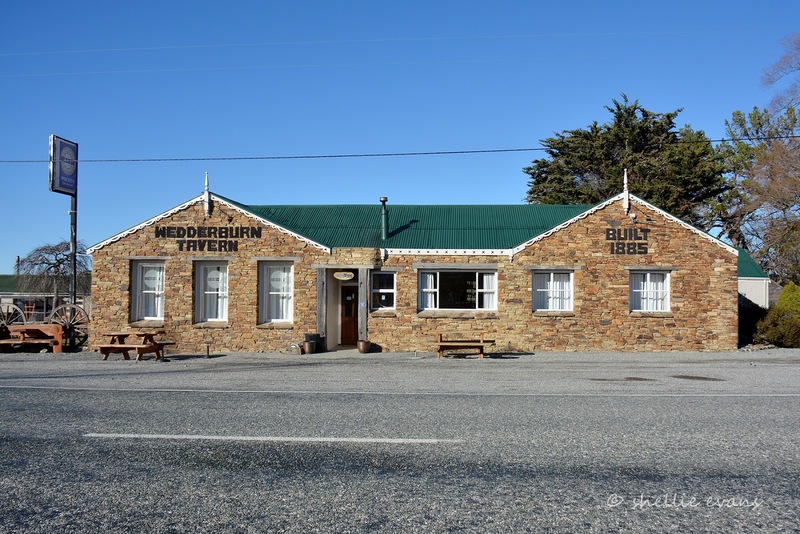 Just up the road from the goods shed is the historic Wedderburn Tavern, built in 1885. 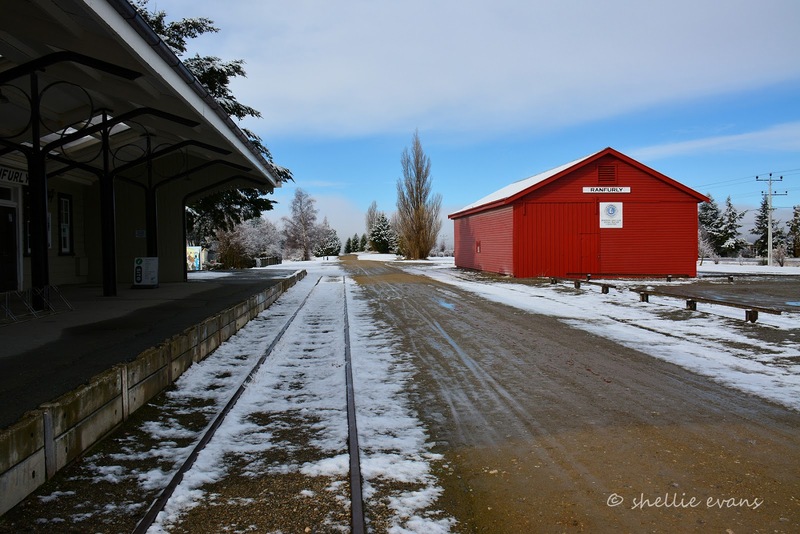 Once the a stop-over for coaches and wagons, it is now a favourite destination and half way point for cyclists on the Rail Trail. 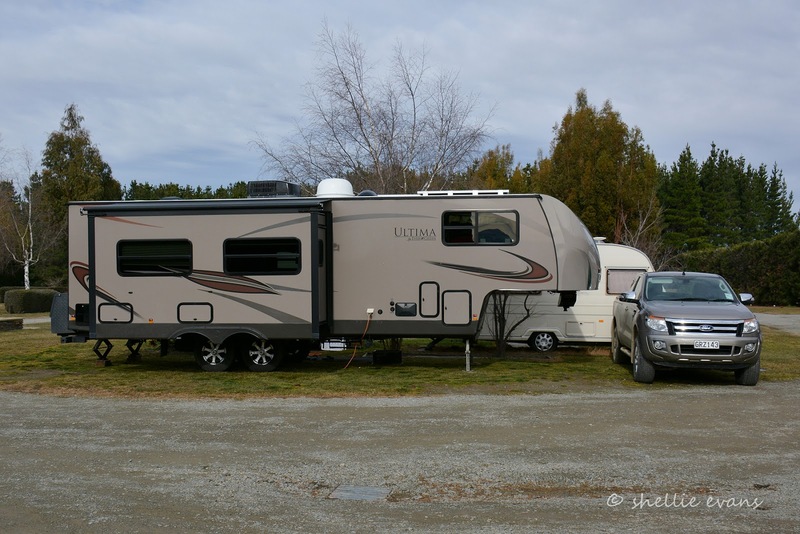 Our next camping site was at the Ranfurly Holiday Park, it was time to plug back into the grid and give the generator a bit of a break. We are very power hungry couple (well David will say it’s just me) but the truth is we both use a lot of power in various forms and while we do quite adequately cope with our solar panels and generator it’s just nice to sometimes plug in and not worry about turning off the extra lights, watching TV a little later, leaving the computer running between jobs or using the toaster & the microwave (both out of bounds when off the grid). Then there are the long hot showers we can have, although they're usually outweighed by the bitter cold run across to the ablution block. We also had laundry to do, and there aren’t too many freedom camping spots in the area. Ranfurly is known as the rural Art Deco town and is the smaller (much smaller) Art Deco sister to my home town Napier, the Art Deco Capital of the world (that link will take you to my blog on the Art Deco Weekend in Napier, there are more Art Deco posts out in the menu on the right). 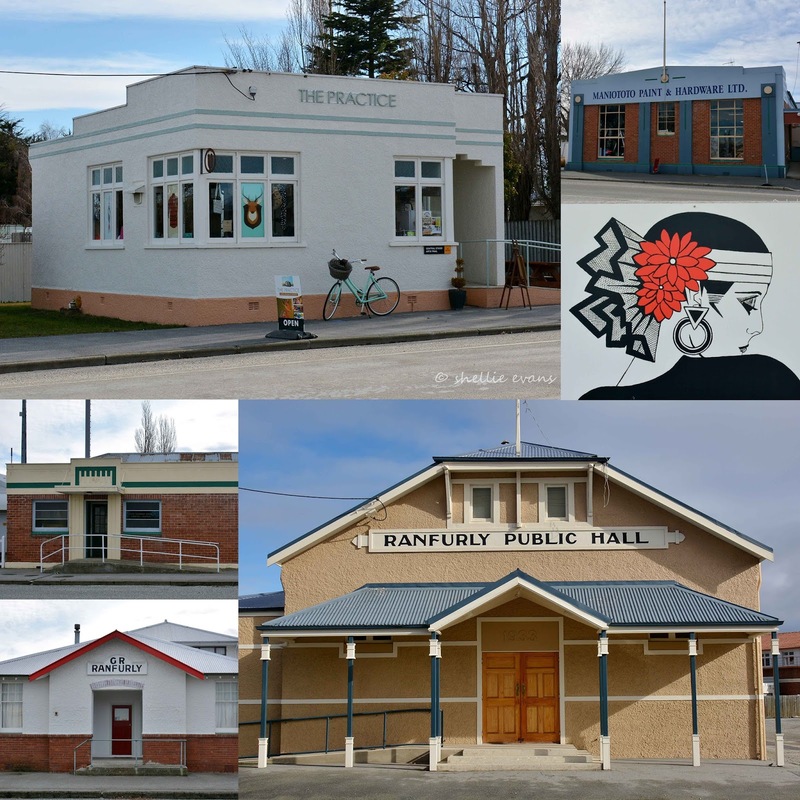 Ranfurly also has a popular art deco festival that attracts people from far and wide and I was looking forward to comparing notes. 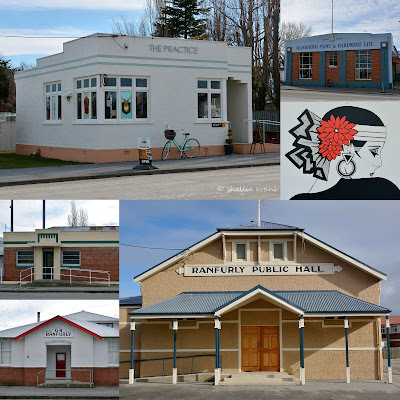 Following a series of disastrous and suspicious fires in the 1930′s that destroyed many of Ranfurly’s buildings, including the town hall and the hotel, the fashionable, inexpensive and simplistic Art Deco style was introduced to Ranfurly to replace many of the towns buildings. 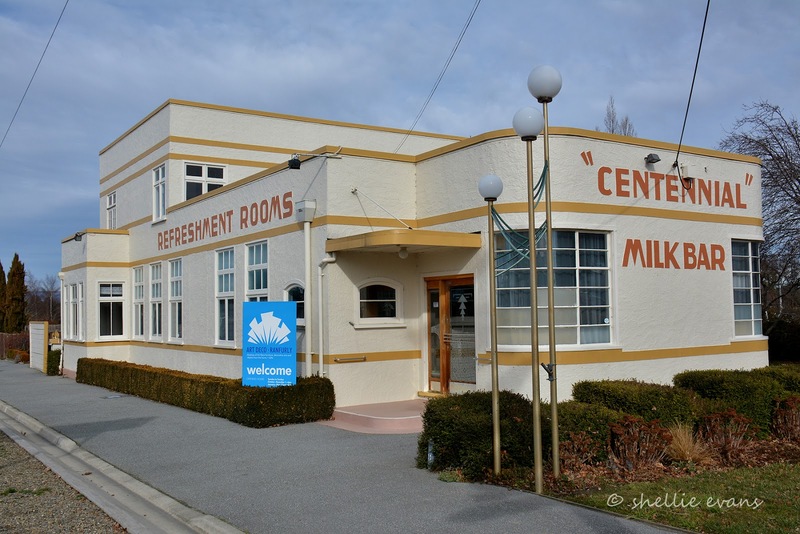 The Centennial Milk Bar is the iconic art deco building in Ranfurly. 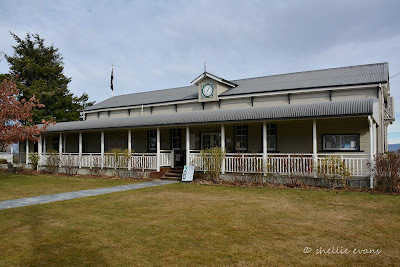 It is located beside the I-Site (once the Railway Station) in the main street and in its heyday it was a bustling place serving hungry passengers from the trains and afternoon teas and icecreams to the locals. By the mid 1970’s the trains had stopped running, the town’s already small population had dwindled and the milk bar was abandoned & rundown. The only interest in the prominent but derelict art deco building on the main street was from the local fire brigade who were looking for something to burn down for a practice exercise. 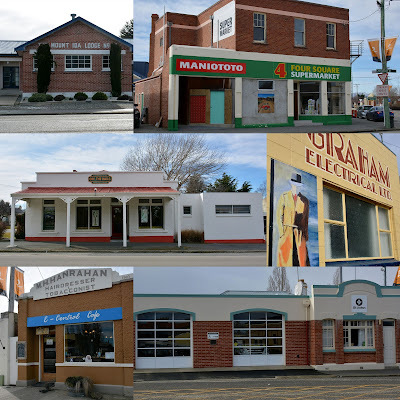 After the economic decline of the 1990′s, the local community was thinking of ways to attract people to Ranfurly and came up with the idea of reviving the forty-odd art deco buildings located throughout the town to create an ‘Art Deco’ theme for Ranfurly. In 2000 the Central Otago District Council purchased the Centennial Milk Bar and leased it to the town’s Art Deco Society who set it up as an Art Deco Gallery. Local families have lent or donated their treasures and the displays, set up as rooms; bring to life the glamour and glitz of the era- it was closed while we were in town. Street art and murals reflecting the Art Deco era are attached or painted on a number of the buildings along the main street, some are subtly placed so that unless you’re specifically looking for them, they can easily be missed. 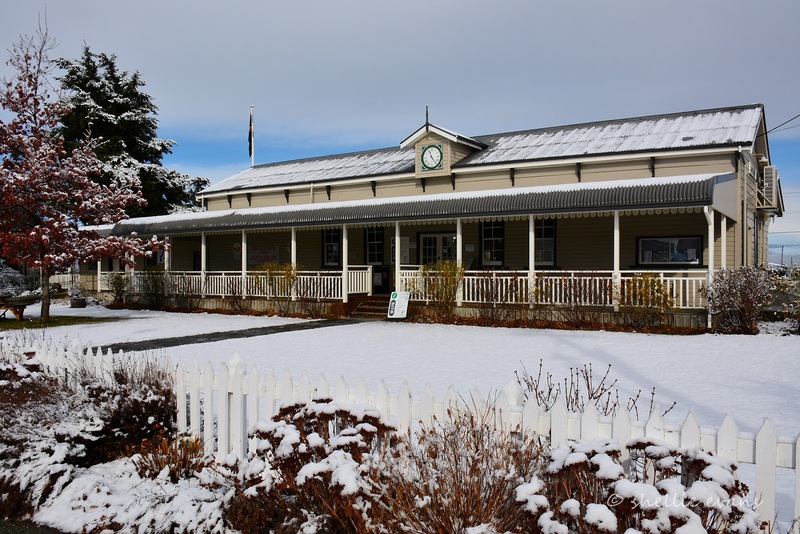 The former Railway Station and now the i-Site (information centre) taken before and after the snow fall we had while we were in Ranfurly. To be fair, we did visit Ranfurly in the middle of winter, but some days when I went walkabout it felt like I was the only person in an abandoned town, a few tumbleweeds rolling down the main street would have completed the picture. 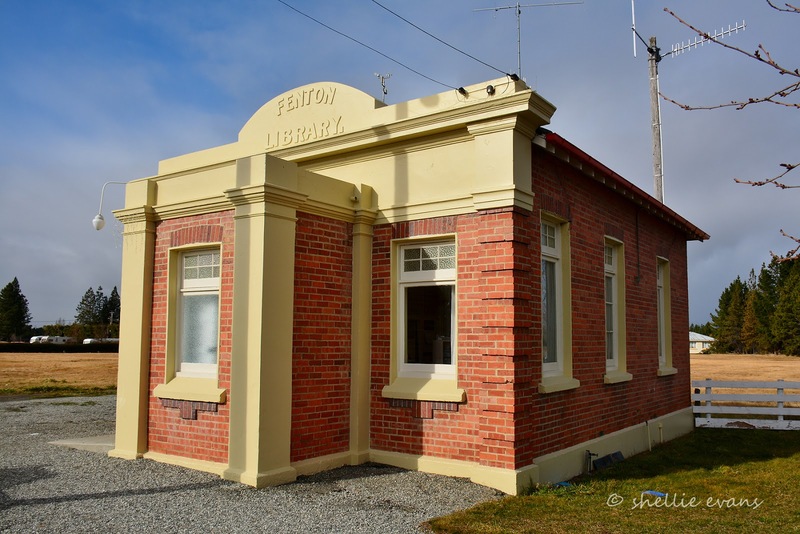 The restored Fenton Library (1926) building houses Ranfurly’s own home grown community trust radio station ‘Burn 729am’. 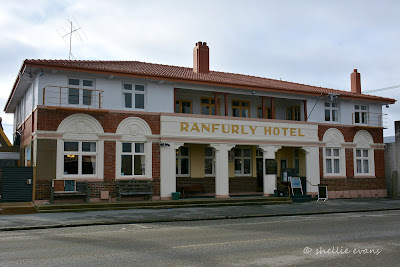 I was searching for a radio station in the early hours of our first morning in Ranfurly and came up with just one station loud and clear. Music was playing for awhile and then the most softly spoken boring monotonous voice I have ever heard came on, he prattled on for ages before playing the next track. 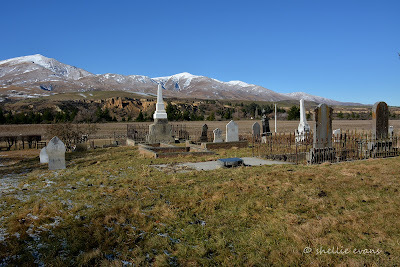 I thought to myself, it must be hard to get decent announcers in Central Otago and they’ve given him the grave-yard shift so he doesn’t scare the punters away. It wasn’t until I went for a walk in the morning that I realised I was listening to Burn 729 out of this building just a few steps away from where I was trying to go to sleep. You can see the campground in the background. I just know the guy sitting outside & nodding off in the sun, with a fag in one hand & a coffee in the other, was my man. I loved the simplicity of the butchers shop just a little further down the road, right down to the huge home-kill cattle carcass they were man-handling out of the small truck and into the shop. 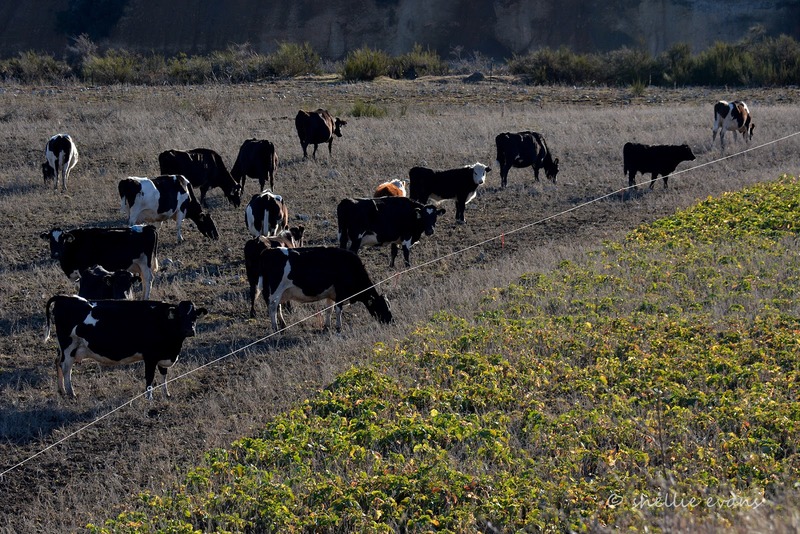 You’d never see that in the city, someone would report them for animal cruelty. 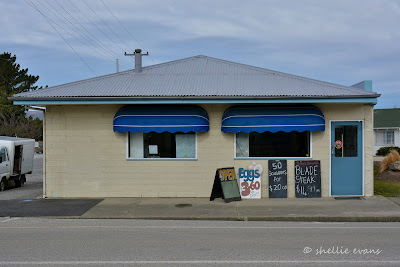 No fancy meats here either; eggs, sausages & steak (where are the chips), hearty meals for the hard working rural folk. And I bet you’ve been wondering when I was going to mention, ‘Thomson’s Barnyard’. On the corner of the main street opposite the Centennial Milk Bar stands the figure of a man looking through a theodolite. This is the memorial to John Turnbull Thomson, he emigrated to New Zealand in 1856 and worked as Chief Surveyor of the Otago Province, surveying and exploring large sections of the interior. One man on a mission, he virtually shaped Central and North Otago. He later became Surveyor-General of New Zealand. Many names in the area can be attributed to Thomson's Northumbrian background and are often in the form of a Northumbrian dialectic name for an animal including Ranfurly which he originally named Eweburn. Names such as Horseburn, Mareburn, Fillyburn, Hogburn, Houndburn, Sowburn and Swinburn were given to streams in the area. Then there’s the Horse Range & the Pigroot. The Kyeburn (cow), Gimmerburn (hogget), Stotburn (steer), and Wedderburn (wether) settlements were all named by Thomson, hence the reason that occasionally the area is referred to as “Thomson’s Barnyard”. Perhaps he'd have been better having the name McDonald. He certainly wandered far and wide, maybe the fact that he had nine daughters had something to do with having to get out of the house. 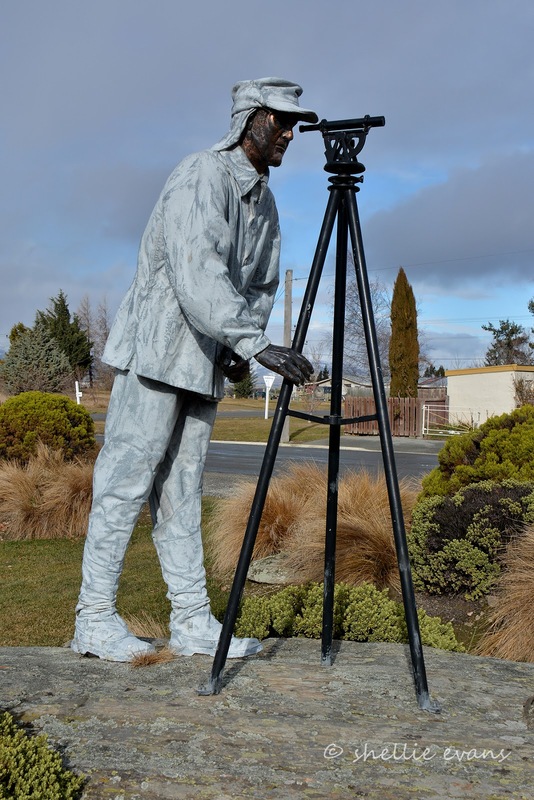 Once he was appointed Surveyor-General he covered most of New Zealand introducing his more accurate method of triangulation survey, using true bearings rather than compass bearings to survey the country. And finally, to book-end the post with another Rail Trail Goods Shed, the Ranfurly Goods Shed after the snow fall.